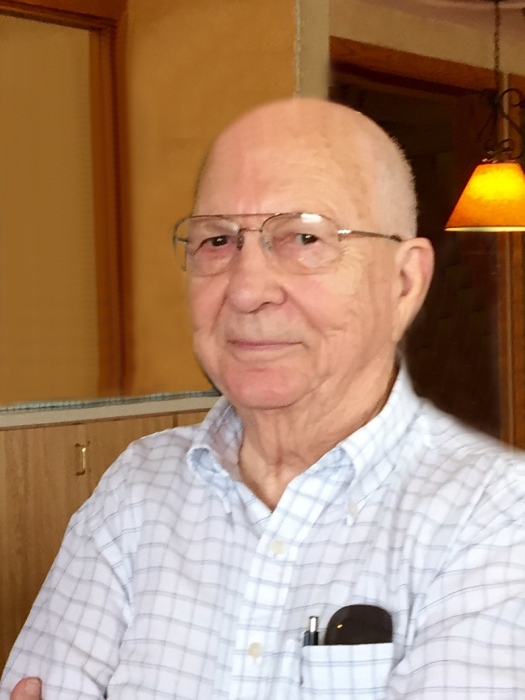 Carlton Greenman passed away on March 21, 2019. Carlton was born Clarence Carlton Greenman on September 28, 1932, at the family farm in Ringgold County, Iowa, to Clifford and Bessie (Reynolds) Greenman. He was the sixth of seven children and often told stories about the time he spent with his siblings and the farm dogs, a collie and a German shepherd. The family later moved into Mt. Ayr, where Carlton attended Mt. Ayr High School. It was there he met his future wife, Carolyn Wells. After graduating from Mt. Ayr High School, Carlton attended William Jewell College in Liberty, Missouri, before enlisting in the U.S. Navy. He served on a troop transport ship in the South China Sea. He returned to the U.S and married Carolyn in Mt. Ayr. After the wedding, they lived briefly in San Diego where he was stationed. They moved back to West Des Moines and welcomed their daughters Pamela and Debra. The family resided in West Des Moines, apart from a brief period when they lived in Minot, North Dakota and St. Paul, Minnesota. Carlton attended the Naval Dental Technical School while in San Diego and was a Certified Dental Technician. He owned dental laboratories, and later worked as a representative for the W.E. Mowrey Company of St. Paul for 30 years. He was an artist who worked in many mediums, including clay and painting, and loved designing jewelry. An active member of the Community of Christ church, his faith was an important part of his life. He held several pastoral offices and was ordained as a bishop. Carlton’s daughters were his pride and joy. A member of a large and close-knit family, he also cherished the time spent with his many nieces, nephews, and cousins. He enjoyed family reunions, and was often found visiting with his extended family all over central and southern Iowa. He loved being a grandfather, and spent hours playing games, reading, teaching his grandkids to drive tractors, going shopping, and especially eating ice cream. He was thrilled to become a great-grandfather for the first time in the coming months. Carlton and his family appreciated the extraordinary care he received from the staff at The Village at Legacy Pointe in Waukee during his illness. Prior to his recent illness, Carlton resided at the Lodge of Ashworth. He enjoyed living there and made many friends amongst the residents and staff. Carlton is survived by his daughters Pamela Dahl and Debra (Jay) Albright; his grandchildren Kate (Mike) Levasseur, Melissa Dahl, and Christian Dahl; a great-grandchild expected later this summer; sisters-in-law, Lou Greenman and Sue (Sidney) Jackson; companion Dorothy Harkrader; and many beloved nieces, nephews and cousins all over the United States. He was preceded in death by his beloved wife, Carolyn; his parents, Clifford and Bessie; his sisters Wilma, Edna, Alice and Etta Ruth; his brothers, Wilbur and Roger; and son-in-law Harry Dahl. Per Carlton’s wishes, a private interment was held. A memorial service will take place on Thursday, April 4th, at 10:00 am at the Community of Christ church, 1645 Pennsylvania Avenue in Des Moines, Iowa. In lieu of flowers, memorial contributions may be made to the West Des Moines congregation of the Community of Christ church or American Brawn, an organization supporting the U.S. Military and First Responders.